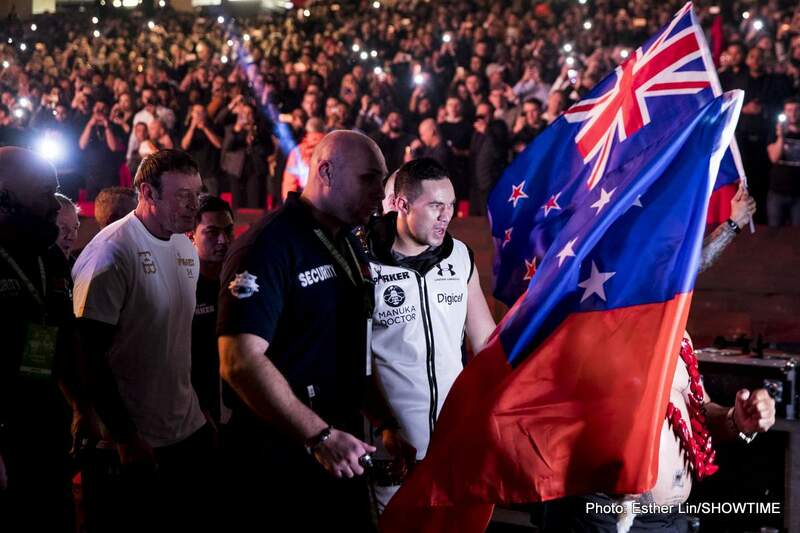 Though he was widely outpointed by Anthony Joshua in his biggest fight to date, former WBO heavyweight champ Joseph Parker saw his stock rise a little due to the manner in which he became the first man to extend AJ all 12 rounds. Certainly, Parker is young enough to be able to come again. And right now, he and his team are making plans for his return to action. Parker isn’t looking at facing a soft touch in his first fight back, either. Speaking with Sky Sports, Parker’s promoter Dave Higgins said there is a “50/50 chance” of Parker’s return bout taking place in the UK and that Dillian Whyte and the winner of the May 5 return between Tony Bellew and David Haye are possible fights. Parker against either Whyte or the Bellew-Haye winner would be very interesting, and, as Higgins says, risky – for both sides. There will be no easy fights for Parker now it seems. Whyte has other options – including a possible elimination bout with Kubrat Pulev – and as for whoever wins out of Bellew and Haye, no-one knows what he might do next. Haye has spoken of the possibility of the May 5 fight being his last, while it’s not clear how long Bellew aims to box on for. Parker still holds plenty of ambition and from a UK fight fans’ perspective it would be good to see him return to action against a British contender. Some fighters, after suffering their maiden defeat, disappear for the longest time, but it seems this will not be the case with the former WBO heavyweight champ.